This report describes the physical features and water resources within the Central Lake Ontario Source Protection Area jurisdiction. Using approved provincial methodologies, it delineates vulnerable areas and assesses specific activities that pose potential drinking water threats within these vulnerable areas. Where drinking water threats have been identified as significant, the Source Protection Plan outlines what policies will apply. Chapter 1 provides a brief overview of the provincial context for source water protection, previous work done on this issue, and the goals of the source water protection planning process. Chapter 2 describes the physical and human characteristics of the Central Lake Ontario Source Protection Area jurisdiction, including its physiography, geology, hydrology, terrestrial and aquatic ecology, human characterization, water quality, and water uses. Chapter 3 summarizes the water budget and water quantity stress assessment. Chapter 4 identifies the vulnerable areas required as part of the source protection program within the study area. Chapter 5 describes how drinking water threats and issues were identified and lists threats within Central Lake Ontario Source Protection Area’s jurisdiction. Chapter 6 summarizes the Assessment Report contents and next steps. Chapter 7 provides a list of references, which includes a number of technical reports prepared by consultants. Appendix A provides a description of the Data Sources. Appendix B provides additional information for Chapter 2 on the Watershed Characterization data gaps and supplementary water quality data. Appendix C documents the methodologies employed in the development of understanding the water supply and demand across the CLOSPA. Appendix D provides additional documentation of the Vulnerable Areas assessment process including the MOE Technical Bulletins on vulnerability. 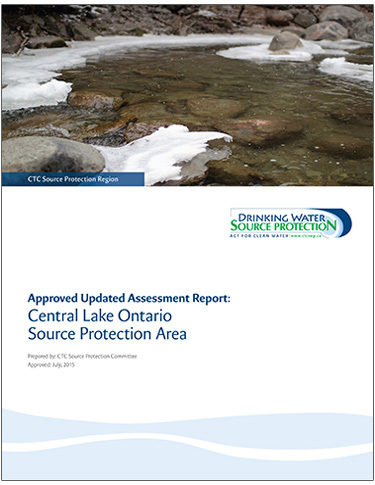 Appendix E includes the MOE Technical Bulletin for the threat assessment process as well as output from the South Georgian Bay Lake Simcoe conformance exercise on the enumeration of threats, summaries of the municipal threat assessment reports prepared for municipalities and a summary of the work completed for the Lake Ontario Collaborative for the assessment of threats to Lake Ontario drinking water intakes. There are no existing significant drinking water quantity threats related to municipal drinking water supplies and no significant drinking water quality threats, conditions, or issues related to groundwater sources identified in this Assessment Report The Lake Ontario modelling identified 8 significant drinking water quality threats related to Lake Ontario intakes within the Central Lake Ontario Source Protection Area.